OnePlus 6 has become the most popular smartphone ever manufactured by OnePlus. The company has sold a record-breaking number of these smartphones. The Chinese phone maker sold over 1 Million phones within 22 days. OnePlus 6 has a beautiful design, solid build and comes with top-notch hardware. Since this phone is being picked up by masses, it’s important to have all of its resources like the Firmware files, stock recoveries etc. I have got my hands on all the OnePlus 6 Stock Firmware and OTA Updates. Along with these files, there are also the stock recovery images for all the builds of OnePlus 6. 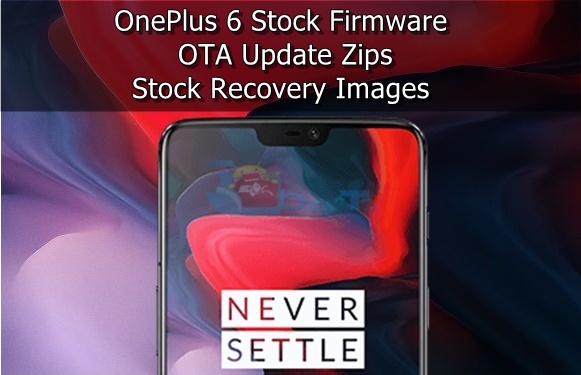 If you are looking for OnePlus 6 official stock firmware, OnePlus 6 OTA Update.zip files or the stock recovery images, you are at the right spot. From this post, you can download your desired files. Before heading towards the download links, let’s throw some light at this phone. The OnePlus 6 has a 6.28-inch AMOLED display having a resolution of 1080 x 2160 pixels. At the top of the display, an iPhone-X like notch can be found which houses the proximity sensor and the front camera. OnePlus 6 is powered by Qualcomm Snapdragon 845 CPU accompanied by Adreno 630 GPU. The phone comes in various RAM and storage options. You can get a 64GB storage variant with 6GB RAM or you can get a 128/256GB storage variant with 8GB RAM. OnePlus 6 has a 16MP + 20MP shooter at the back which supports 4K@60FPS. On the front, it has a 16MP Shooter. The phone runs on Android 8.1 Oreo out of the box. OnePlus uses its own UI called the OxygenOS to theme the Android OS on its phones. OnePlus 6 was running on Android Oreo OxygenOS 5.1.2 at the time of its release. Since then, the phone has got a handful of updates improving its stability, performance, fixing some bugs and adding some new features. The latest version of OxygenOS is 5.1.8 at the time of writing this post. If you are carrying a OnePlus 6 that stays connected to the internet most of the time, there are likely chances that your phone is running on latest version of OxygenOS. If unfortunately, your phone is not running on the latest OxygenOS, you can quickly check for OTA update from the System updates option under settings. And if there is no OTA update available in your region yet, your only chance to update your phone is by manually installing the latest firmware or OTA.zip file. You don’t have to worry about manually installing a firmware on your OnePlus 6. The company makes it extremely easy for the users to install the firmware. It doesn’t matter whether you want to flash an OTA Update file or the entire stock firmware, you are going to be able to do that by tapping a few options inside your phone. OnePlus has made its phones development-friendly. These phones are extremely easy to handle manually. Download your desired OnePlus 6 firmware from here. The instructions to install all the firmware files are also given below. Follow the steps carefully to upgrade your phone to latest OOS. How to install OTA Update.zip file? Go to your phone > Settings > About phone > OxygenOS version > check the version. Now download the update file from the files linked above according to your version. Copy the update file to your phone’s internal storage. It should be on the root, and not inside any folder. On your phone, go to Settings > System updates > Tap the small gear icon at the top-right > Local upgrade. Select the file that you just copied and install it. That’s all. How to install stock ROM on OnePlus 6? Download and install Minimal ADB And Fastboot Drivers. Download the ROM and unpack/extract it on your computer’s desktop. Enable USB Debugging and OEM Unlocking on your OP6. Power down your phone. Now press and hold Volume Up + Power button to turn it on. Use Volume Down button to select fastboot mode. Now from the extracted files, run flash-all.bat file. It will install stock ROM on your OP6.